It’s almost time for Halloween again! I just love how creative of a holiday it is, a time when everyone seems to tap into their creative side. Every year, I love looking at houses and costumes and try to pick out which one I think is the most creative and unique. Sadly, last year we discovered our street is not a hot bed trick-o-treating destination. Since we are also going to be in the middle of our kitchen renovation, we have decided not to put out any Halloween stuff this year. I’m pretty disappointed, but it gives me another year to get more ideas and horde all the spooky things I find now that I love! Last year, I got myself these two skeletons and liked the idea of having them chill out on the front porch. If I do this setup again, I’m gonna dress the human. Maybe a hat and necktie? I’ll also add a dark blanket behind him so he stands out against the chair a bit better. Here are some other front porch ideas I’ve found that I’m really digging right now! I’m also trying to think of things I can do in our bay window since that’s such a large area we could use as a feature for curb appeal. I keep thinking of trying to find a bunch of old candle sticks and painting them all black. Or adding some extra flower pots with hands growing out of them instead of plants. You know… something subtle and creepy! I also dream about throwing a Halloween party one day. 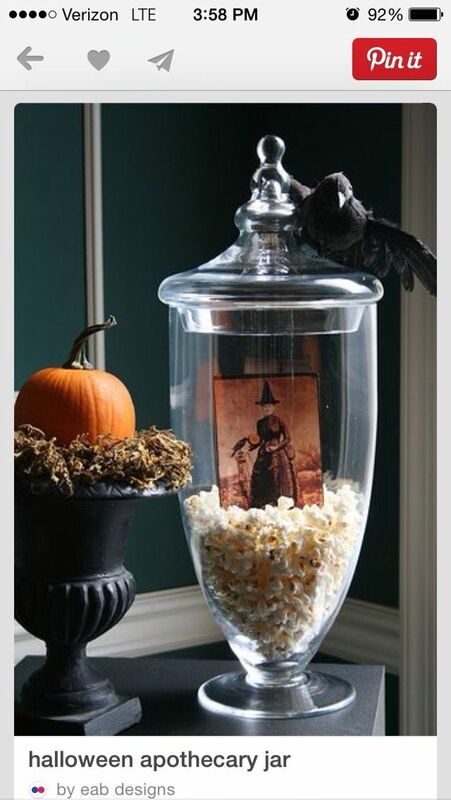 Share good food, laugh with great friends and have fun spookifying the house. My absolute favorite thing I’ve seen are these DIY floating candles that Chris Loves Julia did a couple years ago – nailed it! I’ll be hitting up all the Halloween decor aisles and sales, getting a years head start. Next year friends! I’ll be ready!